Toted by some as the worst movie of the 90's, I beg to differ and I can still fondly remember seeing this movie with all my university friends that had us all in stitches. We have a running joke about a movie being so funny that we need to bring Ventolin inhalers (asthma sprays) and this was one of those movies. 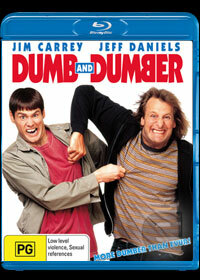 The idiots... err... directors responsible for Dumb and Dumber are the Farrelly brothers that include Peter and Bobby who have created a truly remarkable comedy that uses every cliché, stereotype and gutter humour reference and with that said, be warned, for this movie is not for the light hearted. Whether it's giving a blind boy a dead budgie, urinating in bottles and then letting a police officer drink from them, giving your best friend a coffee full of laxatives or licking a frozen pole, Dumb and Dumber is truly a comedy of epic and stupid proportions. The tale behind the movie involves two nitwits, Lloyd Christmas (Jim Carey) and Harry Dunne (Jeff Daniels) are two idiotic best friends that by circumstance, they stumble on a briefcase of stolen money. As their lives have finally hit the bottom of the toilet, they decide to embark on a cross-country road trip to return the money, however the temptation of spending the money is too great for them and they eventually begin spending, however they do leave "I owe you" notes behind. A game of cat and mouse ensues from the criminals that owned the brief case and also a stalker... err love interest for both Lloyd and Harry that still had me in stitches those so many years later. The movie also starred Lauren Holly who eventually become Carey's wife for a brief time, however the stars of the movie are Carey and Daniels who really bounce off each other in this wonderfully entertaining movie. On Blu-ray, the video quality is of a good level with sharp images and a good colour palette that is matched perfectly by the surround sound. Brilliant from start to finish, just don't take it too seriously and it's a shame that this movie spawned a really bad sequel without the original stars!